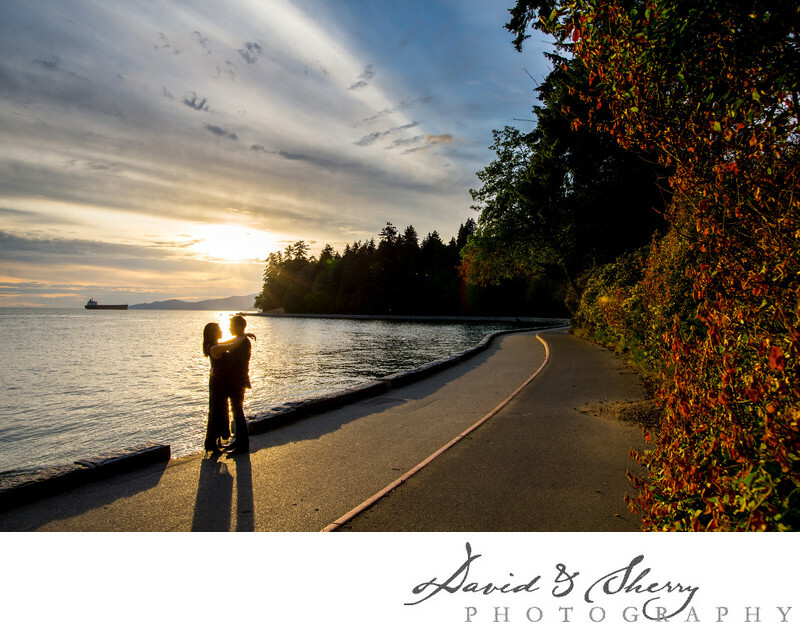 Stanley park is the best location in Vancouver for engagement photos and It is also the most popular. The world famous park which is almost an island off the north end of the city of Vancouver is surrounded by the Pacific Ocean and the Burrard Inlet. Whether you get up early and get the morning sunrise on the East side of the park or stay late and get sunset on the West side you are presented with beautiful locations and light through the unique layout of the park. There are also fantastic locations within including Hollow Tree, Prospect Point Lookout, Lions Gate Bridge, Siwash Rock, the Lost Lagoon, which has a path surrounding the lake and lots of wildlife, the Seawall, Aquarium and famous Stanley Park Pavilion. It is also common to see beavers, bald eagles, raccoons, ducks, geese, all manor of birds, sea lions, and otters. This photo which took place on the seawall at sunset on the west side of the park has the couple silhouetted against the bright reflecting water of the orange colourful sunset with the path off to the right of the couple. We composed it in such a way so the clouds point in towards the bride and groom and shows off both the park and the ocean. Stanley Park is located in Vancouver, B.C.